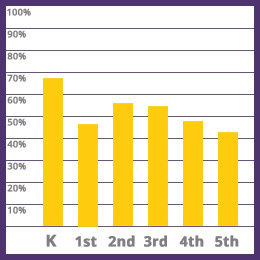 We are at the halfway point in our campaign, and the overall percentage of families participating in the Annual Fund is at 51%! Way to go! The Annual Fund is the largest contributor to the PTA budget, which is why we are asking for the support of all Chabot families. Any and all donations are appreciated in any amount. The campaign ends on October 30th, and we are confident we can hit our 100% participation goal by then. Let’s keep the momentum going! Anytime by completing the donation form and dropping it off at the PTA membership box outside the main office. Each of your children’s classes will receive credit for your contribution to the Annual Fund, and PTA membership campaign. You do not need to make separate donations for each child. Every student counts. Every gift counts.